Product DetailsFunko Pop Chip and Dale celebrates the Disney duo with several vinyl options. In addition to multi-packs featuring the two chipmunks, a small line is available for Chip 'n Dale: Rescue Rangers. Originally created in the 1940s, Chip and Dale may not be the most famous Disney rodents (see Mickey Mouse), but they are certainly popular in their own right. Funko Pop Chip and Dale covers the more classic interpretation with a flocked two-pack issued at 2017 San Diego Comic-Con. Buy Chip and Dale Pop figures on Amazon. There is also a Kingdom Hearts version, as well. This two-pack dresses the pair in their video game garb. 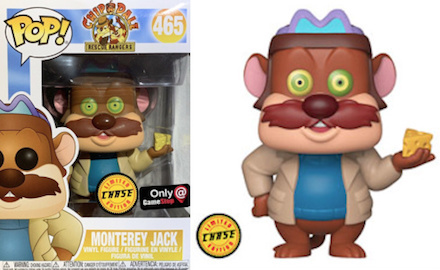 Moving away from the famed chipmunks, 2018 GameStop Black Friday Mystery Box offers collectors Monterey Jack from Chip 'n Dale: Rescue Rangers, the 1980s/1990s television series. Options include a base version holding a wedge of cheese and a chase variant with a hypnotized Jack. Please contact us if you spot any other Funko Pop Chip and Dale figures. Click the listings below to shop specific figures on Amazon or eBay. Funko Pop! Chip N Dale Rescue Rangers "Montery Jack" Vinyl Figure Game Stop ex. Funko Pop! 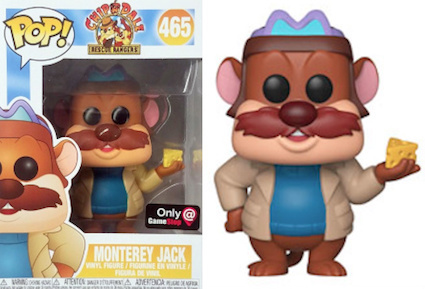 Chip N Dale Monterey Jack #465 Gamestop Exclusive WITH PROTECTOR! SDCC 2017 Exclusive Funko POP! Disney: Chip & Dale 2-pack Flocked IN HAND!